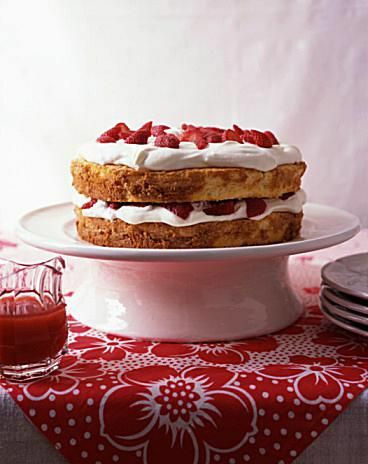 This strawberry shortcake is made with a soft dough with an egg. The dough is baked in a round cake pan then it is split horizontally and filled. Prepare strawberries an hour or two before serving. Slice the fresh strawberries, leaving 8 to 12 whole for garnishing. Place the sliced berries in a bowl; add 3/4 cup brown sugar or granulated sugar and let stand for at least 1 hour at room temperature. Combine flour, 1/4 cup of sugar, baking powder, salt, and nutmeg. Sift. Work in butter with pastry blender or fingertips; add egg and milk. Mix just until dough is moist. Turn dough into a buttered and floured 8 or 9-inch round cake pan and pat into shape. Bake for about 15 to 20 minutes, or until golden brown. Test with a toothpick inserted in the center. If it comes out with dough clinging to it, lower the heat to 350° and bake about 5 more minutes. Remove from the pan and split horizontally with a serrated knife. Butter the cut side of both layers. Put layers together with strawberries and their juice between the layers and on top. Garnish with several whole berries, if desired, and serve with whipped cream.